Galveston Island may be small, but over the past few decades has become one of Texas’ most popular vacation destinations. 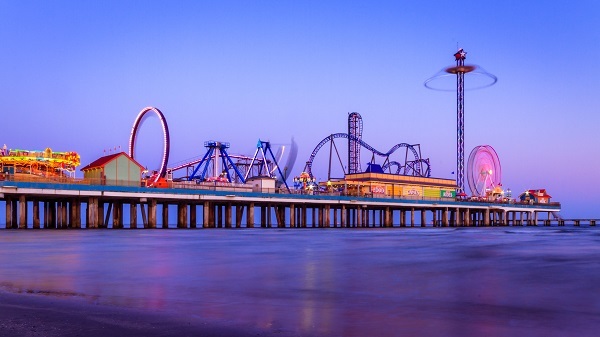 Galveston Island Pleasure Pier is easily the local attraction most focused on family fun. For a small amusement park, it’s made a big impact. “Galveston Island has grown from being a place you go on the weekend to a real resort town, and we’ve helped bring that in,” says Josh Hairgrove, the park’s general manager. “The parks been around since the 40s, and there’s been some form of attraction in that spot since the turn of the century.” Originally built to be part of a military base, it was later open to the public, going through many incarnations due to hurricanes and other natural disasters. Reborn as you see it now in 2012, it’s now one of the island’s premier attractions. 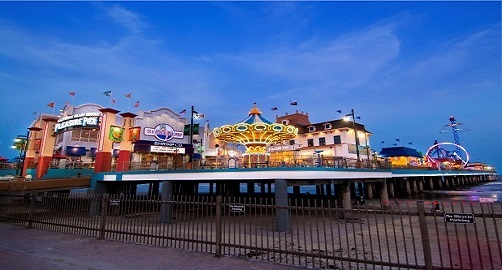 The park has 16 rides, four food and beverage stops, retailer shops, a stage for live concerts, and the front of the pier is even the home to the first Bubba Gump’s Shrimp. Divided into sections, it’s easy to navigate. Hairgrove says, “When you first come in you see the double-decker carousel.” That’s where you can find the kiddie rides and sweet shops, perfect for making the little one happy. The more moderate coasters are in the middle, like the Cyclone and Pirate’s Plunge.